A garden inoculant is really just anything we use to bring beneficial microbes into our organic gardens. Improve the structure of the soil so it has the right amount of air spaces, water spaces, nutrient availability, pH, etc. Before we get into products that you can purchase to bring into the garden that are microbial inoculants I wanted to talk briefly about how we can culture our own micro-organisms. The easiest example of that would be to go into a nearby forest and get a little bit of soil, bring it into the garden or the compost pile and what you’re doing there is you’re bringing in a different set of micro-organisms. Or if you went also to a, like a pond – a marshy area- that would be a different set of microbes, too and you can bring that to your compost pile or just kind of spread it on your garden. And that’s a great way to bring in a different set of microbes. Now we don’t want to be bringing in wheelbarrows full of soil from other ecosystems, but just a little bit is a great idea. What I want to show you today is something else that I’ve done a few times just for fun mainly, is to culture my own lactobacillus which is a very important group of bacteria that do a lot of good things in the soil. I don’t tend to do it that often because they are in the product effective micro-organisms along with another group, another couple of groups of microbes that are really important, really beneficial when you get them altogether. Whereas this is just mainly the lactobacillus. But, I like to do it because it’s just neat to show you how you can culture your own microbes and beneficial ones at that. It will also be useful for – it’s great for kids – but it’s also good if you don’t want to bring in too many external inputs but you want to do something beneficial for the garden this is useful. So, what I’ll do here is I’ll turn the camera down to the table here. And I’ll show you. Ok. So what I’m going to do here – it’s a couple of weeks it takes – but there’s not much. The first step is to take a small amount of rice. I don’t know I have about a quarter cup of rice here and I’m going to rinse it in a little bit of water. And I’m just rinsing it, getting all that, you know when you rinse rice it gets to be a nice murky water and I guess that’s kind of a going to be a substrate for microbes to grow on also maybe there will be some microbes in there, on the rice, too. And then what I’m going to do is strain that into another container – into this container here – and I’m just going to put it into a maximum of fifty percent full. I’ll do more about twenty-five percent full so really you want the container to be fifty to seventy-five percent empty. Now what I’m going to do is loosely cover it up, make sure some air can get in there and leave it at room temperature for about a week and then we’ll see what happens next. It’s been a week and there’s some yellow showing up in the water which is the rice bran and I want to kind of separate that out and just take the underlying part and that’s what I’m going to do now. I may need to strain it out, I don’t have the best strainer. And what I’m going to be doing is I’m going to be adding 10 times as much milk, so I guess I should have said at the beginning if you’re vegan you’re not going to want to do this. And my family none of us drink milk anymore so I had to go borrow some but what you probably want to do is put it in a bigger container. What I’m going to do is just take not too much. There that worked pretty well to strain that out. So what’s going on now is we have various micro-organisms in here, some of them will be lactobacillus. When I add the milk it’s going to – it’s not going to feed the other ones – but it’s going to feed primarily the lactobacillus. I think you can use like skim milk, powdered milk things like that, but I think real milk is best. I’m guessing cows milk is best for this. So I’ll stir that around a bit and then I’m going to leave this for another week or so. Just again with a loose lid. Here we have the finished lactobacillus, it’s only been a couple of days but it’s pretty warm out so it happened really quickly and you can see what happens here is there’s some white stuff floating on the top here, it kind of smells like cheese because that’s lactic acid bacteria or the main micro-organisms in cheese and I don’t really want that stuff I just want to throw that into the compost bin or something like that. So what I’ll do here is see if my strainer works, strain it out. Can you see underneath there’s kind of a clear, yellow liquid? That’s what I’m looking for. That’s what I want to try and pour. I hardly even need the strainer. Nice. So now I just have that. And this is what I want. So here’s my lactobacillus and I can mix this week equal parts molasses, if I want to try and store it for awhile and use it over a longer period of time. Obviously that’s a lot of molasses. You don’t have to use the full amount of molasses but a little bit’s nice. The other thing is you can put it into the fridge and that will help it store even better but the molasses just helps to give some sugar to the microbes if you want to store them. In terms of using it, what I would do is I would take my lactobacillus or my lactobacillus/molasses mixture and put it into twenty parts water when I’m ready to use it. And you know, in the past what I’ve done is I’ve actually used that, that one to twenty ratio, but I think what you’re supposed to do is take that and further dilute it one to sixty if I’m understanding it correctly. So really, you’re diverting this about one to twelve-hundred parts water, or, I guess simple would be a little less than a teaspoon in a gallon of water. And then you can spray it onto your organic matter, your compost pile, lactobacillus are great at getting into any anaerobic pockets and decomposing, getting to the ammonium and really decomposing it, controlling odors and things like that. Also just onto your mulch, onto your plants. Lactic acid bacteria create enzymes and hormones and antibacterial substances and all kinds of good stuff, they’re just really microbes. I’ll be talking about them more when we get into EM because they’re in effective micro-organisms, too. Incidentally when we do mix this with water we want to do it with non-chlorinated water, nice clean water and I’ll talk about that a lot when I get into compost tea because that’s really important for brewing compost tea, too. Hopefully you get a chance to do this just as a, if not just as an interesting experiment but also a very, very inexpensive way to put some of the most important micro-organisms out there into your garden. High quality compost is one of the best ways to introduce these beneficial microbes, if you’re lucky enough to have some around. Effective Microorganisms (EM) and SCD Probiotics. This is a mix of especially beneficial microbes that do all kinds of good when sprayed on the soil and plant leaves. Mycorrhizal Fungi. These are perhaps the most important soil microbes in the world, forming relationships with over 90% of plants. Aerated Compost Tea. A liquid produced by bubbling air through a very small amount of quality compost along with microbe foods. These garden inoculants have had a huge impact on my garden. But perhaps you’d prefer to make your own inoculant, maybe to save money or to be more sustainable or because you just think it would be cool, man. That’s what I’m going to share today, a lesson right from my online gardening course. What we’re going to do is gather and multiply Lactobacillus bacteria, which are especially beneficial microbes. I learned this process from Gil Carandang of Herbana Farms in the Philippines. Personally, I’ve mostly just done it for fun because they also come in EM, which is something I use a lot and know is more useful. Still, culturing Lactobacillus is great for people who don’t have access to or don’t want to bring in many external inputs. Milk for the lactose that will dissuade other microbes from living there while being a perfect environment for the lactic acid bacteria. I prefer organic whole milk, but any kind will do. I used to think cow’s milk was better, but it doesn’t matter at all. Obviously if you’re a vegan you can’t use milk. I’ve never seen it done with anything else, but I imagine there are other liquid mediums that would encourage Lactobacillus. For example, I’ve made water kefir before, which includes several species of lactic acid bacteria, and doesn’t use milk. But today, we’re using milk. Let’s say you’re going to make a pint of garden inoculant, which is a little less than 500mL. That would be 3 Tbsp of grain and 450mL of milk – less than $1 worth of materials. Rinse the grain in some warm, dechlorinated water. If your water has chlorine, you can get rid of it by letting it sit out for 24 hours in a sunny spot. If it has chloramine, you can tie it up by putting pretty much any organic material in there. Vitamin C is often used, but even just a bit of molasses or sugar or lots of things will apparently do it. It happens instantly. Pour that rinse water into a container, leaving the container 50%-75% empty. This gives us our complex carbohydrates. Put on a loose lid/paper towel/cheesecloth so that air can still get in, but not fruit flies or whatever else you might have in your place right now. The grain can be used elsewhere, but isn’t needed anymore for this process. Keep the container at room temperature out of the sun for 2-7 days – the colder the temperature, the longer it takes. Once you see a thin film on the surface and a sense a bit of a sour smell, strain the liquid into a bigger container and add 10 times as much milk. This time, it’s better to keep air out of the process, so put a lid on tight. After the first couple/few days, it’s a good idea to ‘burp’ it by unscrewing the lid and screwing it back on, in case any gases are building up. In another 2-7 days you should have some solids floating on top that can go into the soil or compost, and a clear, yellow fluid underneath that contains the beneficial microbes. Separate this fluid into another container. It will store in the fridge for a year or more. You can add up to an equal amount of unsulfured molasses or sugar to keep the bacteria fed, which apparently allows it to be stored out of the fridge, but I just keep it in the fridge. When it’s time to use some, mix it with approximately 1000 parts non-chlorinated water (about 1/2 teaspoon per gallon of water) and spray it as a plant inoculant and soil inoculant. (When I learned about it this, I was taught to mix it with 20 parts water first, but then that gets mixed with about 60 parts water, so that would mean 1200 parts water total – I just round down to 1000, as this is far from an exact science). I’ve never seen an application rate, so I just spray my plants until the leaves are dripping. These lactic acid bacteria will play some role in doing most of the things I mentioned above – making nutrients more available to plants, protecting from predators, etc. You can also use it as a seed inoculant, soaking seeds overnight with the above dilution. Feel free to ask questions below. P.S. Again I should mention that EM contains Lactobacillus along with other beneficial microbes, and is certainly more effective than using a culture with only Lactobacillus, but still, if you don’t have EM, it’s definitely worthwhile using this one. Thanks, Phil. You are amazing the way you freely share your knowledge with all of us. Mother Earth is very happy to have you as a mascot. I’m off to soak some rice and begin, even though it snowed yesterday and they’re calling for more snow. My compost bin could use some of this now, as it’s filled to the brim. It’s been a terribly long winter. Thanks for sharing. I want to know if one can use milk power or canned milk and what quantity should we add even though yo mentioned ten times. Yes, people say that while unpasteurized milk is best, even powdered and canned milk can work okay, but they don’t say how much to use. The exact amount doesn’t seem to matter, though, so just try to approximate regular milk. Phil you do it just for fun?! !I am proud of you for giving credit to Gil for the recipe but there is a little more to it than that. Lacto bacterias are said to be the ,work horse in EM’. Further, they come in many kind. Infect wash at different places and you get many. They are a little more than ‘just for fun’. Also, if you have the luck of knowing about the teaching of Gil, like I do, surely you must know about Dr. Han Kyu Cho, othwhise known as ‘Master cho’. If you do then you know about BIM (beneficial indigenous micro organisms). No need to buy EM Bro. Besides, EM1 are not approved for sale in Canada, that does it for me. Keep up the good work! Thanks for your input Bob. I’ve heard LAB called the work horse of EM, but it’s the photosynthetic bacteria that are generally considered the most important part. And yet, even more important is how the lactic acid species and yeast and photosynthetic species work together. There are straight lactic acid products on the market, and they can be useful for sure, but they aren’t EM. Of course, we don’t have any peer-reviewed research that compares them. But yes, straight LAB cultures can certainly be helpful, as can BIM. I’m a big fan of both. Just wanted to remind you that of course indigenous micros are better, but in nature they are not contained and propagates through air and birds. I do not believe that this continent had no fertility or worms until the Europeans brought their animals over. Really, where do people come up with this baloney? The bison ate ice cubes before Contact. Hi Melissa, yes, it’s nice to do your first spray on top of the soil while you’re doing this or at some point within a few weeks before planting. It just helps get the soil into better shape before planting. I was wondering if you could make a spray with water and a lactobacillius mixture from a probiotic capsule. Not that I don’t enjoy a fermentation challenge. It just seems like a lot of material for what is used individually. Yes, you absolutely could. As for how much, I must say I have no idea, but certainly worth a try. I may be completely on the wrong track here, but can you use this microbial inoculant to make your own bokashi mix? Will it keep ok mixed in with the dry materials? Yes, you can use this for bokashi. It would be nice to mix in a bit of compost to have a more diverse set of microbes, but it’s possible the lactobacillus would do an okay job on its own. I’d be interested to try it actually. Thanks for sharing this. If I chose to store the inoculant outside then how long or often should I feed it with molasses ? Also, how long will it stay ok ? I would only feed it once with molasses, and I’m not sure how long it will stay okay. I suppose it depends on the temperature. When it gets hot out, it will go bad more quickly, maybe even within a few weeks. When it starts to smell bad, it’s time to dump it. How is this lactobacillus treatment you outline above different from diluting milk 1 part to 10 (total) parts and spraying that on? Is this just a more cost effective method 🙂 ? Thanks for your contributions. Bob the anti-Slug had a good comment about Canadian regulations; A few things are available up here like Harpin and EM. I’m not sure I understand your question? Milk is not a fermentation, so doesn’t contain much in the way of lactobacillus. Yogurt, on the other hand, would probably bring some benefits. Not sure of application rate, but I’d just mix it in water and spray the whole garden. I use the milk and water mix to deter/eradicate fungus on the leaves of a lot of my plants. I live in the tropics so fungus is a common problem here. I love the way you freely share your garden knowledge Phil – thanks so much for all you do for the wider gardening community. This sounds like a great recipe. Really, your just using the fermented whey, right? I make milk kefir daily, gotta try this. What about left over (excess) kefir grains? That is a scoby (symbiotic colony of bacteria and yeast). It’s useful for bowel flora, gotta be good for soil. Which seeds do you soak in this? Think I’m only used to soaking beans. Thank you very much for your time and expertise! And you’re ebook if wonderful, it officially turned all of my gardening “knowledge” upside-down. I’m so excited to give biological gardening a go. I’m sending out a soil test asap. Yes, all of those fermentations we make for ourselves probably have some benefit in the garden – they’re often based on lactic acid bacteria. I soak all seeds in this kind of inoculant – just at the very diluted ratios though. Thanks for the compliment! Hi Phil and Neil, I also brew water and milk Kefir. How exactly have you used it and have you seen the results??? Thanks for sharing….I live in El Salvador and the weather here is tropical but have learned soooo much!!! Hi Norma, I’ve been all about making kombucha for the last 3 years. I don’t know how much of a difference it makes for my health, but it tastes great. I haven’t used kombucha in the garden. Thank you for helping the amateur gardener. You website is most helpful! What do you suggest to use for tomatoes? I don’t do anything different – just use all of my usual inoculants and fertilizers. hi phil, you seem to be a nice person for always sharing your knowledge with eveyone. i live in india and we use a fantastic fertilzer, totallly organic called the panchgavya. u should look it up, it is made up of 5 cow products. cow dung, cow urine, cows milk, curd, and molasses . just mix it for a period of 15 days and then strain and spray on yr plants or just feed it to your plants after diluting it 2 parts to a 100. just fantastic. let me know if u make it. In North America, most of our cow dung contains antibiotics and hormones, so I’m not in the habit of using it much. And I don’t drink milk, so I don’t have it around usually. But if I had my own cows, I would definitely experiment with this. How often do you use this? Can you use too much? It is possible to use too much, although I’m not sure how much that would be. I do it once/month. It could be done daily if a lot less was used. Can what you made be put into a pond filter to produce benificial bacteria to help keep the pond clean and balanced ? It could help a little. I know EM and SCD Probiotics definitely help clean pond water. Phil, is there any way to measure this to use on a hose end sprayer. I have a large yard and mixing by the gallon would take forever. By the way, as everyone else has said, your knowledge and sharing is amazing! Thank you. Ya, if you mix the inoculant with 3 parts water and put that mixture into the hose-end sprayer (e.g. 1/2 cup of inoculant with 1 1/2 cups of water), then set your sprayer to 1 Tbsp per gallon of water, you’ll have a 1:1000 ratio. I learned a lot from your post about planning your landscape. Thank you. I wonder if you have any advice for me as I am renting this home with permission to garden. It is poor soil and has not been cared for in about 8 years. There are fruit trees (apple, plum and pear) that are in desperate need of pruning and are infected by bugs. There are overgrown ivy and blackberry canes at the back of the property. I just would like your ideas on what comes first … what next. At the moment I am a bit overwhelmed. I used the rinse water from some whole grain brown rice noodles. Problem is that the noodles were cooked in that water not just rinsed. I’ve already made the innoculant but am not sure if it will work. It keep congealing even after I put it in the fridge. You can put it in the garden. This will not work. Reason is there are many hundreds of species of bacteria out of which only one works with peas, legumes, etc., It will not hurt you to try, but it is a waste of time. This article is not about the legume-specific inoculants you’re referring to Lumakar – it’s about growing species that are beneficial for all plants. Can you give references?. You can also take virgin soil from forest or undisturbed area and add it to culture. Buy inoculant from INTX or BeckerUnderwood or others. They got specific bacteria in a packet you can use. Thank you for sharing. Can I use whipping cream because I have no milk in my fridge. Also, can I spray on all my plants. Thank you. I’m not sure about whipping cream, Sophie. It’s certainly worth a try. It often has sugar in it, but that’s okay. I would try it on one plant first, but yes, I imagine it’s okay for all plants. Thank you for your answer. I have started one batch using 2% milk ( I went and bought a jar just for this purpose) Currently, it is sitting on the shelf in my shed in the back yard. I have another question for you: You mentioned before that if we mix the inoculant with 3 parts of water and put the mixture into the hose end sprayer ie. a/2 cup of inoculant with 11/2 c water, then set the sprayer to 1 tablespoon per gallon of water we will have 1:1000 ratio. My question is: Wouldn’t the water come out be tap water which is chlorinated? 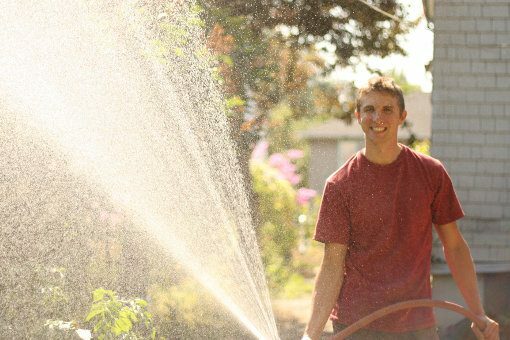 I live in Vanouver area and it is really not easy to save rain water during Summer because it can go without raining for a few months. I am hoping that I can use tap water to spray because I have a huge garden with a lot of fruit trees and vegetables. I fermented my fruits to use as fertilizer and I hope that I can mix this with my fertilizer for my garden. Since my fertilizer is acid base should I dilute the ratio even more. Currently, for every 2 cups of tap water, I add in 1 teaspoon of fertilizer. Thank you very much. Hi Sophie, chlorine (or chloramine) in the water isn’t ideal, but it’s something many of us have to live with, and it’s not the end of the world. Some of the microbes won’t love it, but many will be okay. As for the pH of your fertilizer, a little bit acid is actually a good thing. At 1 teaspoon for 2 cups of water, I expect you probably don’t have to worry about that. Hi Phil, Thank you very much for your advice. I have one more question to ask you. My husband dumped whole bunch of apples that were infested with maggots into the compost pile and I do not know how to deal with it. Do you have any Suggestion? Thank you. I just wouldn’t use that compost on your apple trees (and whichever other plants those particular insects like to eat, if any). But on than than, the maggots/flies should be kept in check fairly quickly once spread into the garden, provided you have a reasonably diverse ecosystem. Hi Phil, Thanks again for your suggestion. Currently, I just use molasses mixed with apple cider to try and catch codling moths. I sprayed dormant oil mixed with surphur on all tree trunks. I hope it helps. Hi Phil, I have a question to ask you: whenever peach trees contacted rain, they will have leaf curl which is some kind of fungus disease. Can l spray lalactobacillus-serum on the leaves to prevent leaf Curls? Sorry I missed this earlier, Sophie. Yes, you certainly can spray the leaves with the serum. It may help. Thanks Phil. I am wondering if hydroponic nutrient solution (like Botanicare) would work as an inoculate for peas growing in soil? It may have some use as a fertilizer, but it’s not an inoculant. For that you need an actual pea inoculant. I had been culturing various aerobic bacteria, until I realized that identifying every specific strain wasn’t feasible (now cycling continually, and sterilizing occasionally). Relying upon one’s luck isn’t a good idea, since the WRONG bacteria holds the potential to make our own luck so VERY bad. Inoculants are not just “any good ol’ bacteria will do,” even though they’re beneficial, as often the species required are very specific to the plant (e.g. your best scenario would cause my crimson clover to not fix Nitrogen well, leaving potentially an extra hundred pounds or so per acre in the winds, as they carried away as many pounds of our soil). Now, just for fun? Folks that don’t wish to eat the products from animals can still use them, just as those of us that choose to avoid eating pork could raise pigs. There are actually eggs being marketed as coming from vegetarian chickens. <~ seriously. I hope you keep experimenting, and sharing your results with others — it's what we all should do, since the better solutions are most often found by us common folks. And, our world sure needs 'em. Can’t I just mix some active yogurt in my compost to healthy bacteria?? Lol sounds dumb but ya never know. Yes, you can. This lesson was more about making a very affordable liquid inoculant to spray on plant leaves. I cannot find a homemade pea inoculant. I see you said above that this not a legume-specific inoculant. Do you know of one or can you direct me to a (free) on-line source for one? Unfortunately, there’s nothing I know of. Hi, C.J., and thanks again to Phil for maintaining a good resource for all. I’ve propagated mycorrhizae for use here, and rhizobia for experimentation (which costs far more than purchasing inoculants as needed), but us regular folks aren’t allowed to transport bacteria. This PDF, provided by the USDA, provides the inoculant code specific to each variety of plant… https://www.nrcs.usda.gov/Internet/FSE_PLANTMATERIALS/publications/etpmctn12525.pdf … and gives good instruction on innoculating seed. If your variety isn’t listed? Holler back, and I’ll try ‘n play ‘matchmaker’ for your seed. I have tons of water kefir grains. Can I mix those with filtered water, some molasses or sugar, lt sit for a few days then apply the whole thing to a lwan in need of care? Not sure if that will work, but there should be some way of using the grains. I will try it and let you know if it works. I found some nice black dirt under my deck, I will throw some of that in too, and see what happens. Hi Phil.i am planting okra and its getting into winter soon. I stay in tropical island. It does not sbow here. Will winter affect my okra plants. Im using mulch to protect the plants. Is that enough or do i have to put something else in my plants. After diluting in water what is the shelf life? How long will the bacteria survive once diluted? I’m not sure how long they’ll live but after a couple of days the usefulness will drop off quite a bit.